Editors: Vincent, Jean-Louis and Hall, Jesse B. The aim of this comprehensive encyclopedia is to provide detailed information on intensive care medicine contributing to the broad field of emergency medicine. 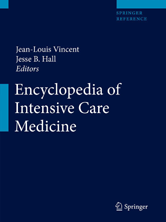 The wide range of entries in the Encyclopedia of Intensive Care Medicine are written by leading experts in the field.